It was like “Ladies Day” at the Northwood Fixture with former Captain Lisa Heywood maintaining her recent great form and Jayne Burden who was recently made an Honorary member of the Society, both featuring in the top finishers. Lisa carried on where she left off at The Berkshire fixture where she was cut two shots to 16 handicap for a convincing win, scoring 39pts points around the challenging Northwood course off her new handicap. 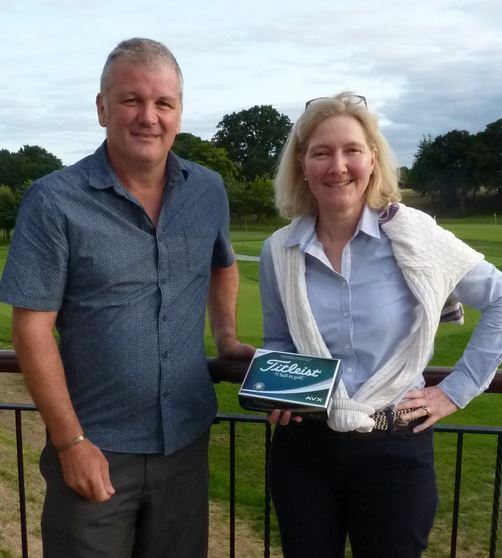 Second place with 37pts was one of the Society’s most consistent golfers and keeper of the handicap records, Ian McGowan and then came Jayne, close up in third with 36pts around her home course. Lisa who is already in the semi-final of the Match-Play knockout competition was cut a further two shots for this latest win and will now play off 14 handicap. Runner-up Ian was cut one shot and will be playing off eight handicap for his next three Society golf days. As with her Berkshire win, Lisa will again submit her scorecard to her home Club so that they can adjust her handicap. Instead of the usual first place prize of a case of wine, Lisa chose instead the very latest Titleist golf ball, the AVX with the Northcliffe “Bumble Bee” logo. These can be purchased on the day or taken as a prize and Lisa decided to choose the golf balls. Jayne took third place with 36pts on countback from both Kerrel Wills in fourth and Society treasurer Will Flint in fifth. 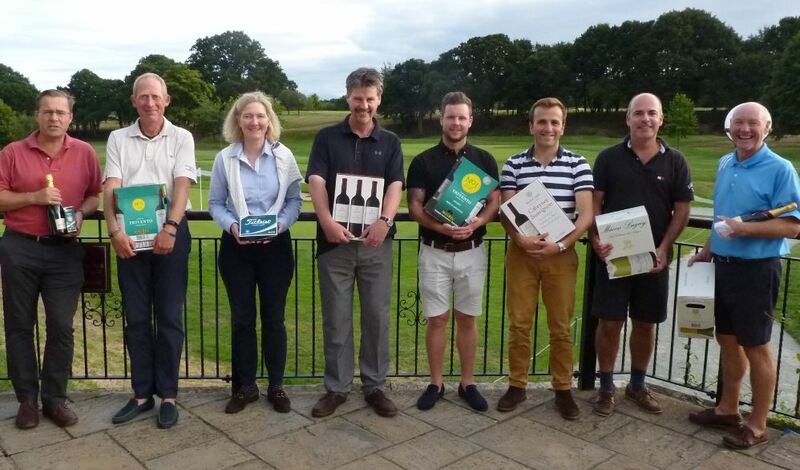 The afternoon Greensomes competition saw a reversal of a match at the Inter Company competition in Portugal when the Daily Mail pairing of Arthur Martin and David Crump just beat, on countback with 39pts, Mail on Sunday’s Nick Craven and Jonathan Bucks. Close up in third with 38pts were former Society treasurer Clive Heard and guest Luke Marvel. Although the fairways like so many golf courses were hard and dry, the greens and fore greens that had been regularly watered during the recent very hot weather made everyone’s short game the toughest part of the course. Champagne for Nearest the Pin on the Par Three third hole was won in the morning by Will Flint with David Crump winning in the afternoon. There were two people scoring “2’s”, Will and Ian McGowan who both won £15 with £10 to the Funds. Both Lisa and guest Alan Baker won £40 each with £40 for the Funds in the “Back the Winner” competition.